My name is Westby Fisher, MD and I work as the Director of Cardiac Electrophysiology at a large health care system in the Chicago Metro area. I am certified by the American Board of Internal Medicine (ABIM) in three specialties: Internal Medicine, Cardiovascular Diseases, and Cardiac Electrophysiology. Because I am nearly 60 years of age, I have watched ABIM’s board certification go from a completely voluntary credential available at the start of our careers to the addition of an entirely new Maintenance of Certification (MOC®) requirement that is time-consuming and expensive with no established relationship to improved physician care or patient outcomes. 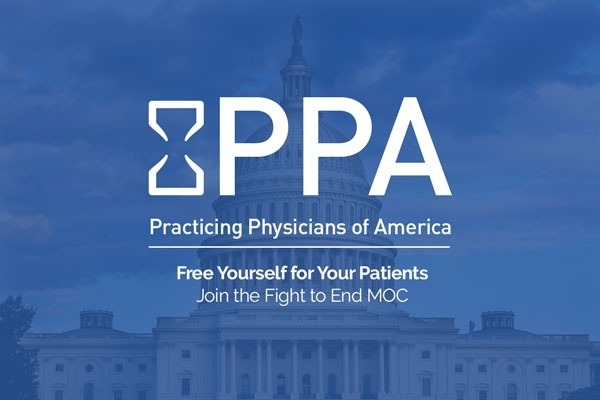 Practicing Physicians of America (PPA) ( https://practicingphysician.org/ ) is sponsoring a campaign through GoFundMe to raise funds in support of three federal class action lawsuits seeking an end to MOC® pending against the ABIM , the American Board of Radiology (ABR), and the American Board of Psychiatry and Neurology (ABPN). I was honored to be the very first person to commit to this campaign almost a year ago in the amount of $1,000, and have shown my continuing commitment by donating an additional $2,500 since then. Simply click on the “Donate” button above to make your donation. Our original goal of $150,000 in seed money was raised in under six months, with over 750 contributors. We have increased the goal to $400,000 to help support the next phase of the litigation as ABIM, ABR, and ABPN prepare their responses to the lawsuits. If you desire anonymity/privacy, you can designate your contribution as anonymous. You also have the option to add a “tip” to help maintain the GoFundMe platform; unlike other websites GoFundMe does not charge a fee to host our campaign. Any “tip” is entirely voluntary, goes directly to GoFundMe, and will not be counted toward our goal. One-hundred percent of your donation will be used to help offset costs and legal fees in the three lawsuits (other than any fee charged by third party payment processors). With your ongoing support the fight against MOC® will continue to be vigorously pursued. The Kenney v. ABIM complaint was amended earlier this week to add federal RICO Act claims and state law unjust enrichment claims. You can find a description of the claims and the full Amended Complaint at http://www.medtees.com/content/ABIMClassActionComplaintAmd.pdf . Your generosity to date has been instrumental in getting us this far. As we enter this new stage of the litigation, any further assistance you can lend by clicking on the “Donate” button above will go 100% to keeping up the fight against MOC. I thank you and your fellow physicians thank you. You can also check in on the status of the lawsuit at any time at http://www.abimlawsuit.com or by visiting this website and clicking on Updates. I am thrilled to update you on the status of our campaign to end MOC™. The initial goal of $150,000 in seed money was realized in under six months, with over 750 contributors. And as you surely know, due in part to your generous assistance, four of our colleagues recently filed federal class action antitrust claims against the American Board of Internal Medicine (ABIM). A copy of the Complaint can be downloaded at http://www.medtees.com/content/ABIMComplaint.pdf. Our investigation continues and additional claims are still being considered. With the Complaint now on file we expect ABIM to aggressively seek dismissal, after which discovery will get underway. To help level the playing field over the next several months we are launching “GoFundMe 2.0" with the goal of raising an additional $250,000. The website and link are unchanged, the current goal has simply been increased. I was honored to be the first person to make a donation toward the original goal in the amount of $1,000, and I am proud to be the first to show my continuing commitment by donating another $2,500 to PPA’s latest GoFundMe campaign. You can show your commitment by making your donation now. While many of us donated more, the average contribution has been $210. That, of course, is a drop in the bucket compared to what MOC costs each and every one of us. If our original donors can give again at that level and an additional 240 contributors join us, we will quickly reach our new goal. As before, all contributions regardless of amount are enormously appreciated. This remains a private campaign and cannot be publicly accessed without the above link. If you desire an additional level of anonymity/privacy, you can designate your contribution as anonymous. As before, you also have the option to add a “tip” to help GoFundMe maintain its platform. Any “tip” is entirely voluntary, goes directly to GoFundMe, and will not be applied to our goal. We could not have reached this point without you, and I hope you will continue to help in the fight to take down MOC™ -- for your own benefit and the benefit of all of us.